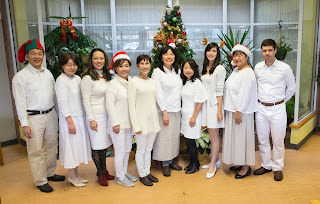 Singing & Piano in Vancouver: Christmas concert in Kerrisdale! Our Apple Choir joined the Opera Zone Concert today and sang Christmas carols for the second half. We had an exciting concert with our great audience, thank you, Kerrisdale Community Centre Society! Great singing during one hour concert! We have more carolling events this season. and our annual visit to the George Pearson Centre on December 17.